Rose's Jump Dress is named after the dress she was wearing in the suicide scene. Rose was going to jump off the back of Titanic and Jack saved her. 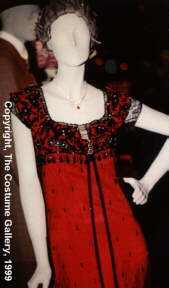 This is one of the most popular dresses from the film. Many teenage girls had reproduction designers make this dress for their prom. 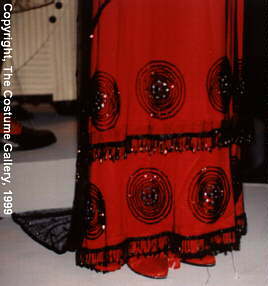 The dress is red with a black net overlay that flows into a square backed train. It has an empire waist and a two tiered skirt. The dress has many beaded features from the bodice to the medallions on the lower parts of the skirt. The hemline of the skirt tiers has drop bead fringe.